Software testing, an integral part of the development process for software applications that meet the highest standards of quality, can be a complex process, to say the least. With the increasing number of functionalities that applications today are bestowed with, not to mention the large number of platforms and browsers to account for, there is an ever increasing possibility of bugs and issues going unnoticed. However, the highly competitive market scenario does not allow software developers the luxury of allowing products with even minor bugs to reach the market, as a product with issues will be outright rejected. In such a scenario, software developers have embraced automation testing to increase the efficiency of the testing process and to maximize test coverage. The best thing about automation is that it not just improves the quality of testing and makes it several times faster, but also reduces the cost involved. Before we move ahead to learn about the role of automation testing and its importance in the sphere of software testing, it’s important to learn the difference between manual and automation testing. Manual software testing involves a human sitting in front of a computer screen and testing an application by trying out the various combinations of usage and inputs to ensure every one of them fetches the desired results when compared to the expected results or behavior that serve as the benchmark. Automation testing, on the other hand, involves testing software applications using scripts and tools instead. The use of automated scripts opens up a whole lot of possibilities when it comes to expanding the scope of testing, and this makes automation testing so essential to software development today. 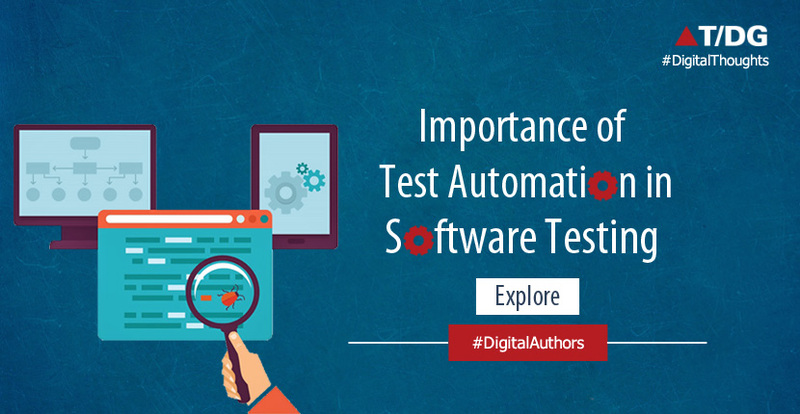 Automation of the software testing process can prove to be beneficial to the Quality Analysis (QA) teams of an organization in several ways, and the key ones are mentioned below. Automation testing can significantly improve the test coverage because it allows lengthy tests to be covered in less time, thus allowing more tests to be covered under the tight timeframe I which software development teams work today. This is possible not just because of the speed of automation but also the fact that a test automation tool can perform tests unattended, which results in better utilization of time. Manual testing does hold the possibility of human errors, even if the most dexterous tester is executing the tests. This scope of errors, no matter how minimal, is completely eliminated with automation testing. Automation testing is significantly faster than manual testing, simply because it involves the use of tools and scripts. This increased speed can give an additional advantage to QA teams as it helps them execute tests multiple times with ease, and still meet the deadlines. Automation testing can execute test cases that are impossible to achieve with manual testing. For example, regression testing, which involves executing a test against multiple sets of data or inputs, can turn out to be a mammoth feat for manual testers but can be easily accomplished with automation. With automation testing, the same set of test cases can be re-used to test different versions of the software and can be upgraded as and when required to incorporate addition of new features and discovery of new bugs. Software testing can get repetitive and an automation testing tool can easily take care of the repetitive steps and at the same time eliminate the risk of human errors. Automation testing makes it possible to detect bugs during the early stages of the software life cycle. While this may seem inconsequential, it can go a long way in saving the time and costs incurred in fixing the bugs later. Whenever there is a change in the source code, the tests can be run automatically to detect any bugs and/or issues. Moreover, the simultaneous running of test cases makes it possible to generate detailed reports for easy comparison. Now that we have learnt about the ways in which automation can benefit the QA teams today, let us have a quick look at how the effect of automation can benefit the organization. Automation testing increases the quality of software. Several factors like the improved test coverage, increased efficiency of testing, and higher levels of accuracy as compared to manual testing, ensure that the end product meets the highest quality standards. This is a significant benefit that a business experiences with the implementation of automation testing. The earlier bugs are detected in the software development lifecycle, the less expensive it is to fix them. Test automation leads to reduction in the cost of bug fixing as bugs can be detected at an earlier stage as compared to manual testing. This can translate to significant cost-reduction for the organization. One of the biggest benefits of automation testing for a business is the significant increase in ROI. The initial investment is what makes many businesses think twice before going ahead with test automation. However, with significant increase in efficiency and productivity, automation fetches a high return on investment (ROI) and this has been proven. Automating your test process makes you save on money and time, which translates to increased ROI in the long run. Automation saves a lot of time through several features like simultaneous execution of test cases, regression testing, etc. The speed that automation brings to the software testing process results in a faster time to market for the product. This is another reason a business should switch to automation as delivering a product within the stipulated timeframe is what every development team aims for. Using automation testing to take care of the mundane and repetitive tasks can boost the morale of your testing team as it gives them the time and opportunity to improve their skill sets and work on more challenging assignments. This positive mindset helps them contribute better to the organization. Automation testing is important because it enables the organization to achieve the goals of testing with ease and at the same time, fetches high ROI that more than compensates for the initial investment. To implement test automation, an organization needs to start with choosing a comprehensive test automation platform like QARA Enterprise that provides a short learning curve and a zero coding framework and offers multiple testing functionalities. Test Automation is like a self-healing process for Software Testing and Quality Assurance. When software glitches keep mushrooming constantly, business risks grow and testing teams face major challenges. Automation frameworks enable testing and development teams to enhance the testing activities and accelerate the development tasks. You have addressed some absolutely critical aspects within the test automation gamut.